We got up at 3 am to organize our Visa for Myanmar. We´ve booked our flights with Air Asia already so we have to. 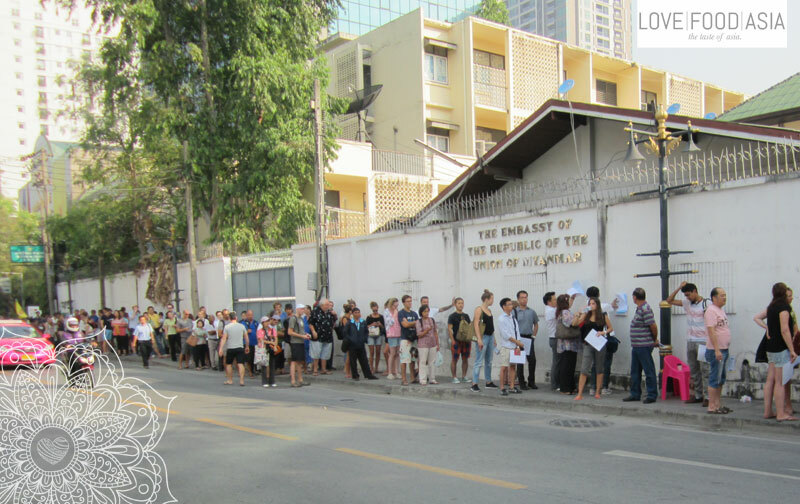 It was Monday morning and it seems that every backpacker in Bangkok tried to organize a Visa at the embassy of Myanmar. But we arrived early enough to stand in the first part of a long line. And so you have to if you want to get your Visa the same day. So it took a few hours until we got our Visa but finally we had it in our passports. Many people that came late that day had to leave again without a Visa. In the afternoon we filled our stomach with good food and went out to a local market where the restaurants buy their stuff. We saw hundred of stalls with vegetables, chicken, pigs and fish. A place where you can smell the fresh blood of a slaughtered pig between all the stalls. The next day we planned to go out for a sightseeing trip in Bangkok for the first time. This trip was 3 years ago and I think now you can get Visa on arrivel. It wasn´t possible when we visited Myanmar in 2013. Next PostThe top places you should visit in Bangkok!